December is a month of opposites, I find. It’s the month dedicated to the celebration of light, in which we have the least amount of light. Days so short they seem to end before lunch. Cloudy skies, elusive sun. 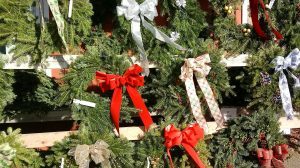 December is the month in which winter starts, and the one which is devoted to greenery. Probably it’s an ancient instinct, to cling to the last bits of green, the evergreen trees and bushes and sprigs of mistletoe, the undying leaves which seemed to promise that the summer wasn’t gone for good. It is a bit odd, when you think of it, to lug as entire tree into your living rooms. But behavior that would seem eccentric in May makes complete sense in a dark month starved for green. One of the best things about December, whether you celebrate Christmas or not, is that almost everywhere you go, there are green branches draped all over things. The more urban the setting, the more greenery. Shopping malls suddenly resemble forests. There’s foliage at the grocery store. Evergreens suddenly crop up everywhere. What does it mean to be evergreen? Actually, “evergreen” isn’t a type of plant, it’s a lifestyle. There are evergreen ferns, oaks, and mosses. “Evergreen” just means they keep some (but not all) of their leaves green all year long. (Needles are leaves, of course, they’re just shaped differently than those of the broad-leaved trees.) But nothing is green forever, and eventually the needles turn brown and die, it just takes them longer than leaves like oak or maple. A pine needle lives about three years, and some types of spruces can hang onto their needles for seven years. Anyway, hardy evergreens like pines, spruces, firs and cedars all get used to deck the halls and malls. Which evergreen is which? Here’s a short field guide. A simple rule of thumb: if the needles are longer than your thumb, it’s probably a pine. There are many species of pine, but some are a lot more prickly than others; the soft needles of white pine are common in those long ropes of greenery that loop around railings and stairways. 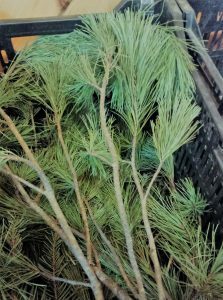 Pine needles come in clusters, so if long needles are attached to the twig in bunches, think pine. If the tree has short needles (an inch or less), and if they’re attached to the twigs singly, it’s probably a spruce or a fir. 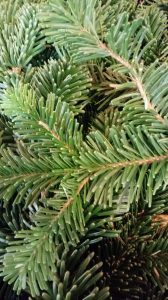 Fir needles are flat, like little bits of green ribbon, whereas spruce needles are more rounded. Fir has a wonderful spicy, resiny fragrance, so it’s a common decoration. 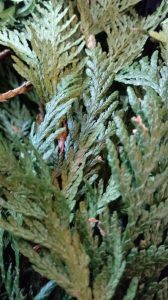 If the plant has a sort of scaly look, a bit like the skin of a flat green reptile, it’s a cedar. Each of the little “scales” is actually a short leaf, and they overlap each other like tiles on a roof.